Several shades of phasing nicely covered, with many more sounds waiting in the wings. 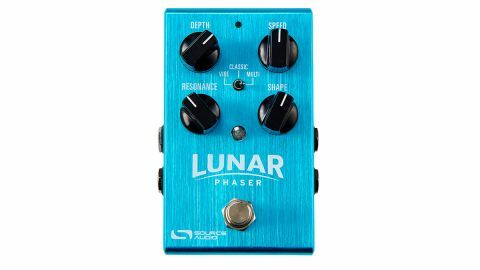 While the Lunar's toggle-switch offers three variations on the phaser theme, along with Speed and Depth controls, we also get a Shape knob that affects the LFO, morphing the sine wave into a harder-edged square wave. There's also a Resonance knob, for dialling in a more metallic sound. Vibe is modelled after a Uni-Vibe and reproduces throb and warble well, while an expression pedal gives you the foot-controlled speed variations of the original. Classic is a simple four-stage phaser like the MXR Phase 90 - which it can emulate nicely when dialled in correctly - but it goes beyond what the single knob on a 90 could conjure up, particularly with the Resonance knob emphasising the 'wow' of the sweep. Multi delivers an eight-stage phaser effect that's more complex and is a great freak-out tool for end-of-set knob manipulators, especially after distortion.